cyberREN's peritoneal dialysis charting function includes peritoneal dialysis training and patient evaluation, peritoneal treatment ordering, access charting and assessment, outpatient and home session charting, as well as peritonitis and access site infection charting. All general charting functions as well as transplant workup charting functions are of course available to caregivers responsible for the administration and management of PD patients. Three types of orders are supported, i.e. for CAPD, IPD and CCPD type treatment schemas. The order may be printed along with the patients Medication List for the patient to take home. A historical record for all past orders for individual patients is kept, which can be analyzed for the entire patient population statistically over time. Two types of PD session charting are available, a detailed record of training sessions conducted within the treatment unit with the assistance of nursing staff, and a simple record of all home dialysis days. 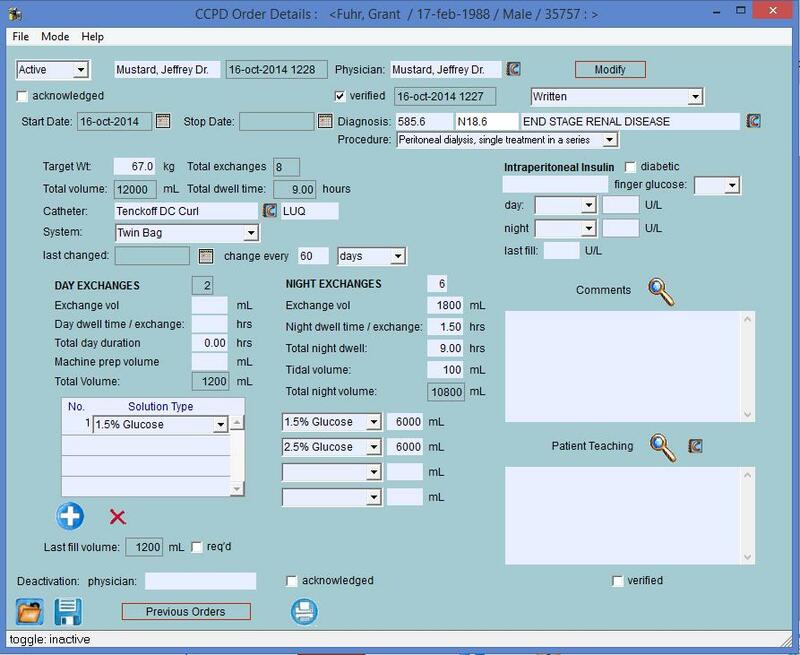 PD charting is fully integrated with cyberREN's charge capture system for complete billing. A complete record of all patients, peritoneal dialysis access is kept, and allows charting of both the location, characteristics and installation of the access, as well as ongoing assessments, complications and revisions. All incidents of peritonitis episodes may be charted completely within the cyberREN record, the episode being characterized by symptoms, organisms found and their sensitivities, as well as the medications and dosages prescribed to treat the peritonitis. An equivalent chart is also available for access site infections. Clinic visits by PD patients may be charted by using several features, depending upon the complexity of the patient examination. cyberREN's Assessment feature is recommended, which allows users to flexibly define examination protocols, consisting of individual examination steps and normal observations, as well as the ability to chart subjective text documenting the actual patient observation. Whenever an order is modified, the original order is retained in a historical record. Charting options (e.g. solution types) are catalogue driven, i.e. the user can determine which options are available for selection.